Maize or makai is also known as ‘corn' in USA. It is utilized in more diversified ways than any other cereal. With its high percentage of carbohydrates, lipid and protein, it is nutritious. Maize is the basis of an extraordinarily wide range of foods including popcorn, corn flour, cornmeal, corn oil and breakfast cereals. Corn syrup made from corn starch is colourless with a high content of fructose and tastes like honey. The ready-to-eat breakfast cereal ‘cornflakes' is a maize product. Tender maize can be boiled or toasted and eaten as ‘corn on the cob'. The whole grain may be cooked or its flour may be used to make chapatti or tortilla. Tortilla is a kind of thin unleavened flat bread made from finely ground maize used widely in Mexico, Central America, USA and Canada. The principal maize varieties are flint corn, dent corn, sweet corn, pop corn, flour corn and waxy corn. This classification is based on the nature and distribution of starch in their endosperm. Maize grains may be white, yellow or reddish in colour. 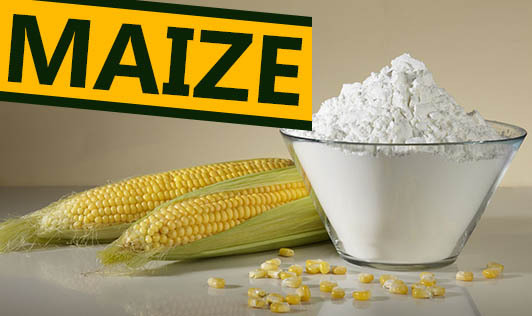 100 grams of maize contain 11.1 grams protein, 3.6g fat, 2.7g fibre, and minerals 1.5%. Like other cereals maize provides about 350 calories per 100grams. Maize is deficient in the vitamin niacin. This can however be made up by eating other foods in the daily diet.